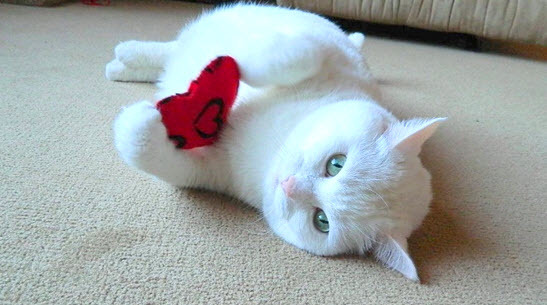 Make a refillable toy for your cat in the shape of a heart! Draw the shape for the heart on a piece of paper, cut out the shape, then use the paper template to cut out the shape from a piece of festive felt two times. Glue a Velcro fastener along the top edge of each piece of fabric on what will be the inside part. Sew the edges of the hearts together, leaving the Velcro area open. Stuff the heart with pieces of a plastic grocery bag and catnip.